Royal Green Odourless Coconut Cooking Cream is produced using certified organic farming. It can be used for baking, to roast, frying and can also be used as a substitute for butter. The oil does not become harmful when it is heated like many other oils and has absolutely no harmful ingredients or free radicals. It has less calories and is easily digestible without trans fats, supporting normal intestinal function. The oil is naturally sugar free and 100% vegetarian, has a positive influence on health and promotes beautiful soft skin and shiny hair. Below are reviews of Royal Green Odourless Coconut Cooking Cream - 2500ml by bodykind customers. If you have tried this product we'd love to hear what you think so please leave a review. Completely odourless and excellent organic coconut oil. Hard to find in shops but great to have it delivered to the door. I use this to make granola, for roasting potatoes and anything else that needs oil for cooking. Keeps well too in a cool larder. I've been looking for coconut oil that doesn't smell so I can cook with it and this one is perfect been reordering it and use in all my cooking. Love it, love it. Really good oil. Use it instead of butter. Much less fattening and better for you. 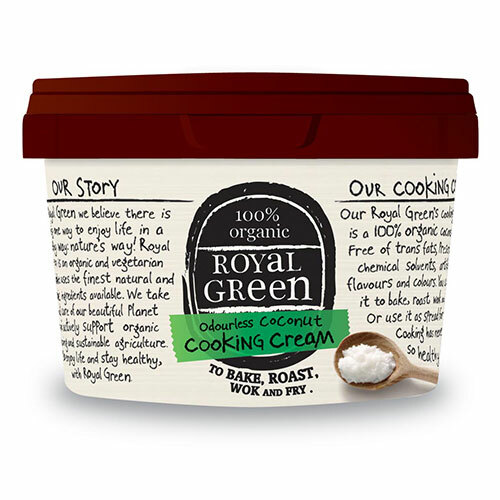 Royal Green Odourless Coconut Cooking Cream is produced using certified organic farming. It can be used for baking, working and frying and can also be used as a substitute for butter.